Spurs, saddles and saddle bags; holsters, derringers, revolvers and rifles; antique bits, badges and bronco belts; Abe Hays has collected them all, and more, for 60 years. And, like most collectors, he finds sharing the story behind these fascinating objects is the most fulfilling part of the hunt. In that spirit, Hays donated 1,400 artifacts, representing 19 states, to Western Spirit: Scottsdale’s Museum of the West. Approximately half of Hays’ collection was exhibited on loan when the museum opened in January 2015, and several hundred additional artifacts have since been added. Among the many treasures that Hays donated is an original “wanted” poster for the arrest of legendary outlaws Clyde Barrow and Bonnie Parker. 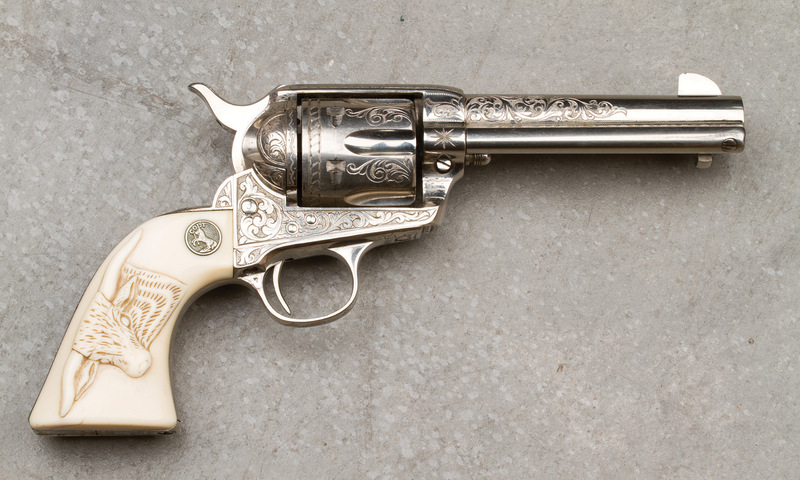 There’s also an impressive collection of spurs, with 125 pairs demonstrating a variety of styles, including Californian, Texan, Wild West Show patterns, trophy varieties, rare prison-made versions and snazzy gold and silver Hollywood examples worthy of John Wayne and Randolph Scott riding into their celluloid sunsets. Hays, who lives in Paradise Valley, Arizona, began his one-of-a-kind collection in the 1940s as a teenager. He first traveled to Arizona in the summer of 1935 with his family from Pennsylvania.They spent time in Flagstaff, below the San Francisco Peaks at Fern Mountain Ranch, and the experience stayed with Hays for a lifetime. After a successful public relations career, he moved to Scottsdale in 1976 and opened the Arizona West Gallery, which was eventually expanded to include a second location. “Making these historical objects a permanent part of the collection at the museum will help ensure that countless residents and visitors — now and into the future — will have an authentic and tangible understanding of our ancestors’ lives,” says Scottsdale’s Mayor, Jim Lane. Abe Hays: My mother exposed me to a variety of museums starting at age 6, and I have been a strong supporter through the years. Since I began to have the funds in my 20s to collect, I have focused on art, artifacts and literature of the West. WA&A: Why, in particular, do you collect Western artifacts? A.H.: A love of Arizona scenery and its geographical and historical sites have inspired me to focus on those subjects. Artists whose best work concentrated on this state were Maynard Dixon, Carl Oscar Borg, William R. Leigh, Frederic Remington, Edgar Payne, Thomas Moran, Gunnar Widforss, George Elbert Burr and Lon Megargee. Another artist of considerable importance to me is Will James, whose drawings and gestural artwork matches that of C.M. Russell’s. I have collected all of these artists to varying degrees. WA&A: What was the first work you purchased, and what made you choose it? A.H.: It was a Remington drawing. He is an unbelievable artist who started as an outstanding illustrator and rose to become a superb impressionist. A.H.: I really don’t have a favorite piece from my 60-plus years of collecting. I can’t think in terms of singularity for any of our collections. A.H.: In my 20s, I was determined to acquire references in printed form, art of geographic and artistic importance and relics of interest and value. Hopefully, they are vital to a museum audience. WA&A: With which living artists would you most like to have dinner? A.H.: If I had to choose two, it would be Maynard Dixon and Will James. WA&A: If you could be or meet any artist in history, who would it be? A.H.: I’d like to meet Frederic Remington or C.M. Russell. A.H.: Unfortunately, there are quite a few pieces of art and artifacts I’ve missed. Probably the main stumbling block was insufficient funds at the time. I’d like to find a Russell illustrated letter or a small impressionistic Remington oil. WA&A: What is the message of your collection to the public? A.H.: I hope that the some 1,400 artifacts, catalogs and art my wife, Lalla, and I have donated to Scottsdale’s Museum of the West will have relevance to the public and to historians. Authenticity and condition of each relic was primary, and there is considerable depth for each category. A.H.: In 100 years, I would want the public to know, understand and appreciate these objects in their relatively brief period of usage from the 1870s to the 1940s. Without exposure in a museum, collections rather quickly become obsolete. A North & Judd Co. buffalo emblem spur with American Indian beadwork (c. 1925) is one of many items on display at the museum. 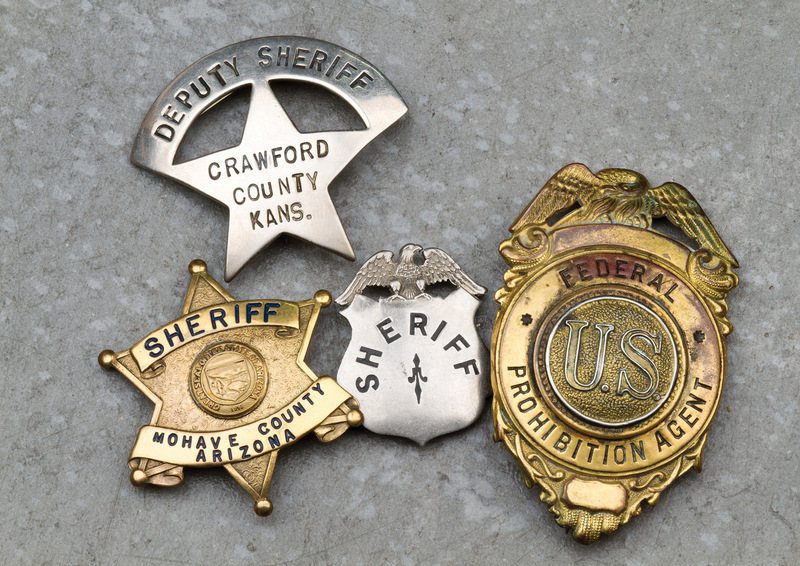 Badges from the Wild West era.